One of the blogs I follow is Find The Factors. It’s very different from this one. For a start, it’s frighteningly efficient, and appears on a daily basis – not like this one, which happens now and again when I get around to it. Iva Sallay gives us a new puzzle every day, where you’re given a few entries in a multiplication square and have to figure out the multipliers heading the columns and rows. So clearly we’re in an area highlighting multiplication facts – in the puzzle below the 42 in the top row has to be the product of 6 and 7 – but we can’t immediately do anything with this because we don’t know if it the 42 comes from 6×7 or 7×6. And the 20 will offer more problems, since we’ll have to discover whether it comes from the product of 2 and 10, or 4 and 5; even then, we must decide on the orientation. This puzzle is number 177, and you’ll usually get some facts about the puzzle number – its factorisation, and in this case, you’re also given a magic square made up of prime numbers; the magic total is 177. The obvious comparison is to Sudoku puzzles. I rarely do Sudoku; I usually find I get so far and then have no option other than guessing between several possibilities until I find the right one. Just occasionally I’ve had to do this with Find The Factors, but generally speaking even at level 6 I can eventually reason the whole thing out. Mind you, sometimes I have to work hard, but that’s surely the whole idea! I’ve shown one of Iva’s 1-12 puzzles, but she also gives 1-10 puzzles as well, and you can have a week’s worth of puzzles to download in Excel format. I do the puzzles for my own enjoyment, but my pupils would find them daunting and indeed too time-consuming. However, the basic idea is one I’m happy to challenge them with, so I may offer them a 4×4 square constructed on the same theme. Once they’d tackled one of those, we’re likely to use the interactive version on the NRICH website (http://nrich.maths.org/7382) where you can find a variety of challenges all based on the same starting point). I do have puzzles that would be just right for students who have barely learned how to divide. Look under Level 1 at http://findthefactors.wordpress.com/puzzle-levels-explained/ for the excel file called Division Facts Puzzles to find puzzles where each number from 1 to 12 is the common factor of its own puzzle. 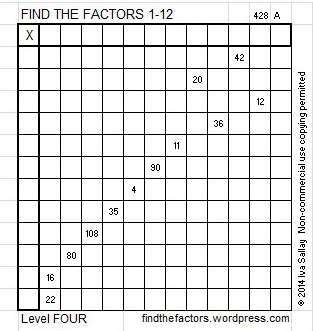 If you tell the students what the common factor is, that puzzle will be easier for them to solve. A pleasure. I really admire your commitment and discipline to produce a puzzle every day!